The debate around whether you should pay influencers in B2B marketing is nothing new. Here’s why you shouldn’t be paying for influence. To me, the value of an influencer program is in developing a concentrated community of highly-regarded individuals within your target audience, that possess a genuine, trusted voice in your field. A voice that is listened to by many is, of course, pretty important. For your selected influencers to hold value they should be considered as part of your overall target audience. Influencer marketing should work on the basis that your influencers are as genuinely excited about your latest offering as the rest of your audience should be. And excitement is something that can’t be bought. If you truly believe in your brand/product – and you expect your influencers to – then there will be many ways that you, the brand, can provide value to the influencer, in return for the guest blog, speaker slot or video appearance that you’re after. It’s all about building out that equal value relationship. So, why do people pay? Lack of offering? Perhaps. Demands of the influencer? Maybe. We’re quick to call out Kim Kardashian as the worst example of influencer marketing. However, if she’s being paid a few thousand dollars to sell hundreds of thousands in product, the ROI is hard to deny. But within B2B, we’re talking about building the required trust and displaying the long-term impact of a new deal to our customers – not a comparatively small consumer purchase. After all, in B2C, consumers are willing to spend money on things they don’t need, whereas in B2B, buyers often aren’t willing to spend money on things they do need. So there is a need for REAL influence, not influencer advertising. 1) Why do B2B influencer marketing in the first place? Our B2B communities tend to be built up of micro-influencers whose collective voice move the needle. Keeping these guys in your favour has a huge positive impact and can only be done through building a long-term relationship and offering them something more meaningful than a bit of cash. Whether this be an opportunity to get information ahead of their peers, increased traffic to their blog or an increase in followers, or even the opportunity to have early access or get ‘hands-on’ with your latest product. 2) Would you pay to start a relationship outside of influencer marketing? I’m still in contact with bloggers I’ve worked with at previous companies and would consider them friends based on the actual relationships built – and these are people that, on reflection, delivered some of the strongest, most impactful influencer activity I’ve ever run. I never even referred to someone in our influencer program as an ‘influencer’ in conversation. They had influence and great content, yes. But, I was keen to get them into the office for a chat, meet for a coffee, or geek out with them on our latest tech. There aren’t many quick wins in influencer marketing. It’s about long-term results. If you don’t have the time to invest in doing it properly, I’d look at focusing on fewer influencers and how you can integrate influencers into existing activities. My disclaimer at this point is that, of course, I wouldn’t expect these guys to cover flights, event entry or even necessary equipment out of their own pocket. It’s the paying of an influencer ‘service’ that, to me, seems the complete wrong way to go. 3) In your role, do you take time to work on getting the best results or look for a quick fix? True influencer generated content or influencer contributed content comes as a result of an established influencer community from true experts in their field who’ve built a following based on their credibility. When combined with your in-house subject matter experts, you can not only spark a unique conversation, but produce top-tier content. At VMware, we had influencer-run activities that reached huge audiences, had fantastic engagement and, in some cases, even contributed significantly to lead gen activity. However, most importantly, all parties left with a smile on their face and another activity was scheduled immediately. B2B influencer marketing does take time to build and can seem like a slow burn – however the investment in people produces long-term reward and a quick payment brings short-term vanity metrics. 4) What are you actually paying for? Some ‘influencers’ do create fantastic, industry-leading content which can have a great impact and should be paid for. So, why not call these people ‘content creators’? 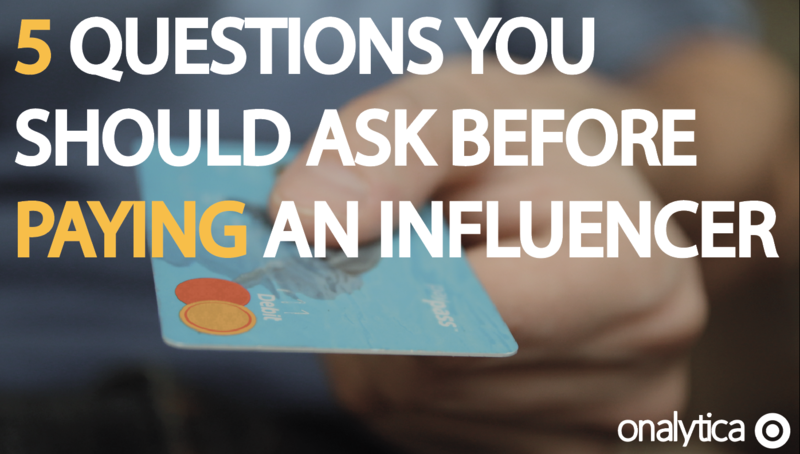 Are you paying an influencer for influence? “Yes”, would seem the obvious answer. And, this is also my main concern. I’ve recently spoken to several influencers who charge for their service and several businesses who pay influencers for content. But if you’re paying for influence, I’d expect to receive some indication of whether or not influence has been achieved. 5) How do you measure success? What other area of marketing would you pay for the means but not the end result? Or in everyday life? You wouldn’t expect your agency to take your budget for an InMail campaign, set up the copy and targeting and then leave you to message each of them individually. Would you get in a taxi, pay the fare and then let the driver aimlessly take you around townin the hope you happen to drive past your house. To me, this seems ludicrous. If you’re paying for content, pay an expert copywriter. If you’re paying for influence, have it clear in your (and their) head what success looks like and the way you’ll achieve that. And, most importantly, I’d expect to have a measurable KPI agreed that demonstrates that both of your objectives have been met. Finally, to my earlier point around naming influencers “influencers”, those who refer to themselves this way are surely highlighting that their allegiance sways with the latest payment and removes the genuineness that makes influencer marketing impactful. Authenticity is key! What’s the saying? Give someone a fish and they will be fed for a day, teach someone to fish and they will be fed for life. If you would like to learn how you can kickstart your organic influencer program, get in touch by clicking the button below.